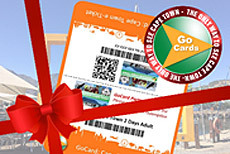 The Go Card is one powerful little E-Ticket that makes exploring easy & affordable! You have access to over 80 partners with a host of different savings and discounts. Be the master of your own itinerary. The E-ticketing system makes payment safe & convenient. Simply present your e-ticket as a printout or on your mobile phone, and you’re set to GO!